``I just wanted to give a big “Thumbs Up” to Christopher Williams and Quality Containers. I am a truck driver and not home very often. Recently I had some home time and my wife and I determined that we needed some outside storage. 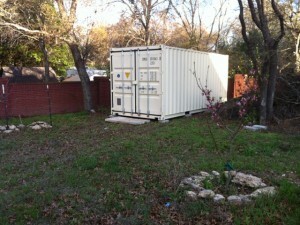 We looked into different storage buildings but decided on a Storage Container, for its durability. We contacted several container companies and quickly learned there are a lot of differences, Christopher was awesome in being up front and helping me get a container to fit my needs and with an Ultra-Fast turn around. Christopher was not the “cheapest” but he worked hard for us to get a quick delivery and at a fair price. ``What a great salesman Todd Howard is. Todd spent a lot of time explaining the different sizes, quality of materials and how I should watch the language of most ads regarding storage containers. Spending a lot of time asking me what my needs for a container were. As it turned out I had sold my house and was in a rush to get a container and Todd answered my needs by giving me a fair price, making sure the container I bought was Water Tight and in good condition, and best of all the container was delivered and installed in 4 days. Wow, that’s customer service to the MAX! ``Thank you for your quick reply in getting our quote on order as quickly as possible. It’s very much appreciated and made ordering easy through Quality Containers. ``We received the container in good time and upon inspection looks to be in great condition and wind and water tight. I experienced great service and acquired a nice container at a very good price. Thank you for facilitating this order and if I am in need of another one I will certainly be contacting you. I will recommend Quality-Containers to anyone I know who is in the market for one. Thank you again, it was a pleasure doing business with you company. ``I wanted to thank you for our containers it was a pleasure dealing with you and your company. They were delivered on time and the drivers were able to put them in place for us. Both containers were in good shape and what you promised us. Thank you for your help and prompt attention in response to my phone call that day. We were only looking to buy one but with your working with us we had two delivered that week. ``All BS aside thank you very much for all your help! Is there someone I can send an email to and tell them how pleasant it was working with you!! Honestly I was looking at other container providers that were more inexpensive the y'alls. But you were so pleasant and helpful that I went with your company!!! ``I can't say enough about the service and dedication of their sales staff. I needed a container the next day and they were able to get it scheduled for delivery within 24 hours. Due to some unique circumstances the following day, I had to cancel the scheduled delivery. Despite not being at fault for these circumstances, they helped resolve the situation and were able to get the delivery rescheduled exactly when I needed it. ``I ordered a container from another company, but after days of trying, the other company simply could not get it delivered. Quality Containers did an excellent job delivering under challenging circumstances: curvy, steep, narrow, mountainous roads. Although we had to contract with McCarty and Sons Towing to get the job done, Quality Containers stuck with it and met the deadline. ``Thank you for providing this quote in a timely manner and for being so patient with all of my questions. As long as I can deal with you, Quality Containers will be my sole source for all of MK Constructors containment needs. ``Working with Todd made ordering my container very easy. He helped me decide which size container I needed for my plans. He took my order right away and I received my container about a week later. ``My wife and I would like to thank you for your outstanding customer service during the procurement of our recently purchased 20 ft cargo container. We had been talking to Aaron at Dry Box, then shopped around before getting in touch with you. The pre-certified cargo ready box, and most importantly your diligence and educative nature with us, is what sold us on you! More than the cost factor, whether we respect and get respect from a given vendor, is our typical deciding factor. Aaron was good, price was good, customer service was exceptional, but.... yours was even above that! Thank you for your patience, for holding onto that box in trusting we were indeed going to purchase it, thank you for educating us in the process, and thank you for your diligence in making this happen for us. We are quickly heading our buisness and family to Alaska and getting the container we needed and getting it as quickly as we can to our home here in Mount Vernon has been and is paramount in this working out successfully. Pending the rest of this transaction goes well and delivery is good, I am sure we will be contatcting you for more boxes in the future as well as referring you and your company personally! ``I am writing this letter because the public, in general, seems far quicker to voice complaints than to give praise. I want to thank and compliment all members of the Quality Container team for my recent transaction. It was refreshing to deal with such a competent team. I particularly want to commend Vince Bellucci for all his assistance and knowledge to help me get the best container at the best price for the purposes needed. Vince went beyond expectations in this transaction. He stayed involved and made sure everything was going smoothly through the entire process. He exercised utmost diligence and delivered on all promises. ``Thank you so much, Duncan, for the prompt and professional service with my new container! I was apprehensive and nervous initially about purchasing something sight unseen but very happy with the box. Thank you for your prompt and friendly service. It was a pleasure doing business with you.